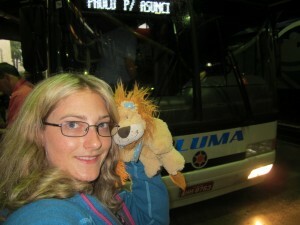 Lewis the Lion and Helen celebrate their birthday on a bus! Two of the most popular questions that Helen (Miss Molloy) and Lewis the Lion were asked in school were: How old is Lewis? 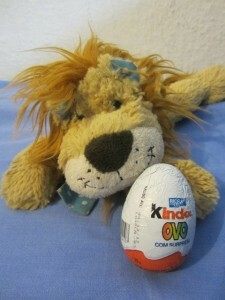 and 2) When is Lewis the Lion’s birthday? Well, Helen is still not sure how old Lewis is because he was already a lion cub when she first met him. However, she does know that he celebrates his birthday on the same day as her, 11th March because he got very excited one year and blew out all the candles on her birthday cake! Consequently, he’s always shared his birthday with Helen ever since. Today, Sunday, 11th March was rather different from most birthdays though as never before had Lewis been so far away from home. After all, do you remember that he is in the Southern Hemisphere? However, today was rather a strange day for Lewis the Lion and Helen to celebrate their birthday as they had a rather long journey ahead of them. They would be travelling all day long to the Iguassu Falls, some of the biggest waterfalls in the world. So, they left the pretty, colonial town of Paraty early in the morning on a mini-bus heading to their first stop of Sao Paolo. (But not before he’d received his first present of the day: a Brazilian Kinder Surprise Egg, together with a beautiful birthday card from his friends in Paraty!). After passing luscious green countryside, sandy beaches, colourful favelas under a bright blue sky, suddenly the weather started to change as dark grey clouds started to push across the sky. Lewis heard a rumble of thunder, a flash of lightening and big, heavy droplets of water started splish-splashing off the windscreen of the minibus. The driver turned on the wipers which squeaked rhythmically across the glass. Not only had the weather changed but so too had the scenery as the bus approached the huge city of Sao Paolo, Brazil’s most inhabited city, and the world’s third largest metropolis. High-rise apartment blocks filled the sky and became denser as the bus neared the bus station. Big bill-boards advertised shops and industrial estates and told Lewis that this must be a centre for industry and commerce. Indeed, Sao Paolo produces half of Brazil’s industrial output and is home to many immigrants, in particular the Italians and Japanese. (It is home to the biggest Japanese population outside of Japan!). Unfortunately on this trip, Lewis the Lion would not get the chance to explore the cultural richness of Sao Paolo and get to know the people of Sao Paulo called Paulistas. 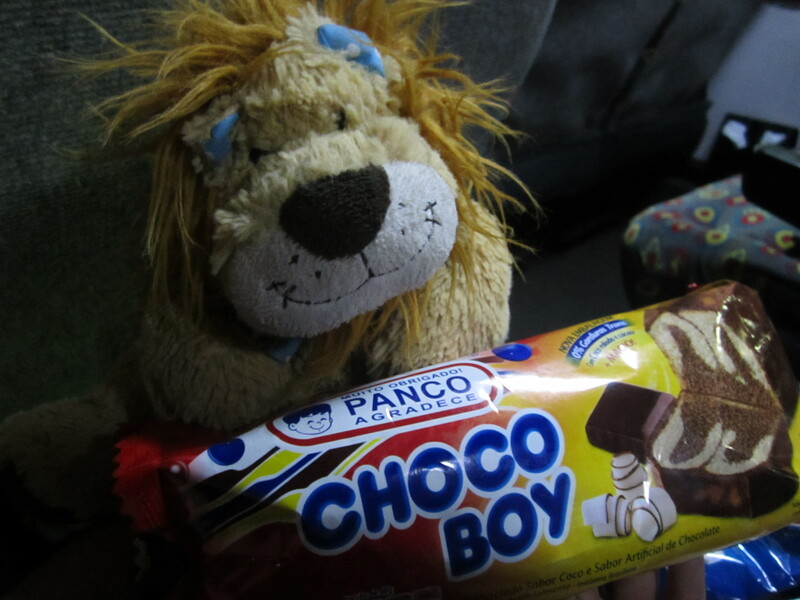 as there was just a brief stop at the coach station before he would be setting off on an overnight bus to the Iguassu Falls. As he waited, he heard the most enormously loud sound in the bus station which sounded like someone had let off fireworks. It wasn’t: it was in fact the rumble of thunder and Lewis the Lion was a little bit scared as he had never heard such loud thunder in his life! This was shortly followed by a massive downpour of rain which beat down with real ferocity. 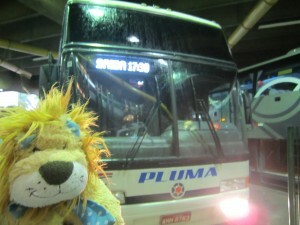 Lewis the Lion hoped the coach would be able to drive safely with so much surface water on the road. As he boarded the coach, Helen had to show the driver her ticket and passport and Lewis was quick to grab a window seat so he could enjoy watching the world go by. 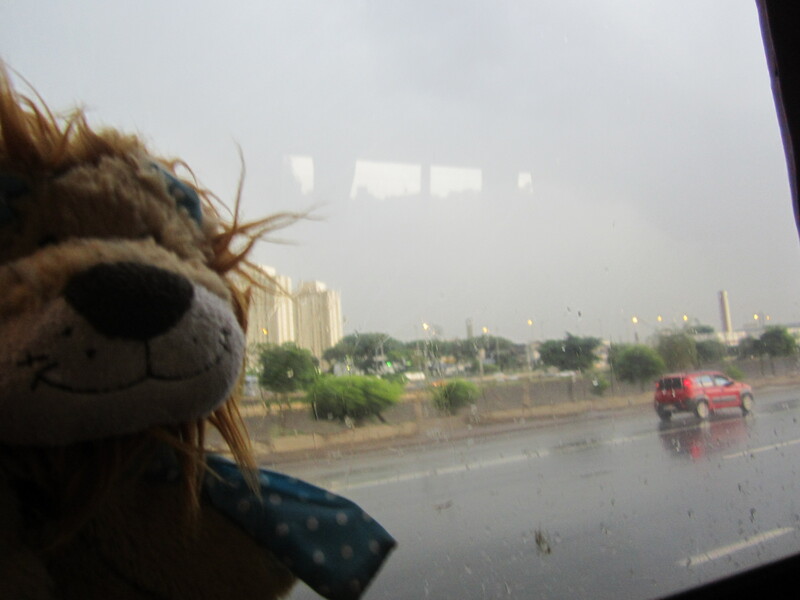 He wondered if he’d made the right decision as he left Sao Paolo as forked-lightening ripped across the sky and the bus seemed to waiver slightly as it drove through huge puddles of water on the motorway. Lewis only hoped that all this rain would swell the waters of the Iguassu Falls, that’s for sure! However, half an hour or so into the journey and as the sun was setting, Lewis enjoyed the most spectacular sunset as the sky looked like it had been set alight as a blast of orange and red colours filled the sky. His friends also made sure that he had the most enjoyable birthday possible whilst sat on a coach and surprised him and Helen with a chocolate and marble birthday cake, together with a special birthday card and a huge, swirly lollipop! The lollipop was so huge, he wondered how on earth he would even start to eat it? After sharing the cake with all his friends, he pulled the lever by his seat which moved his seat back to a 45 degree angle and tried to rest for the remainder of the journey. 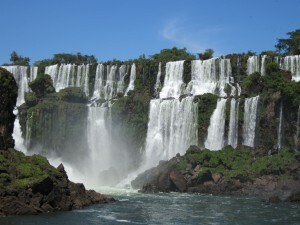 This would be a long overnight journey and he would arrive at the Iguassu Falls at 8:30 the next morning. What’s your favourite way to spend a long journey? Do you have any special games that you play? How do you make the time pass quickly? 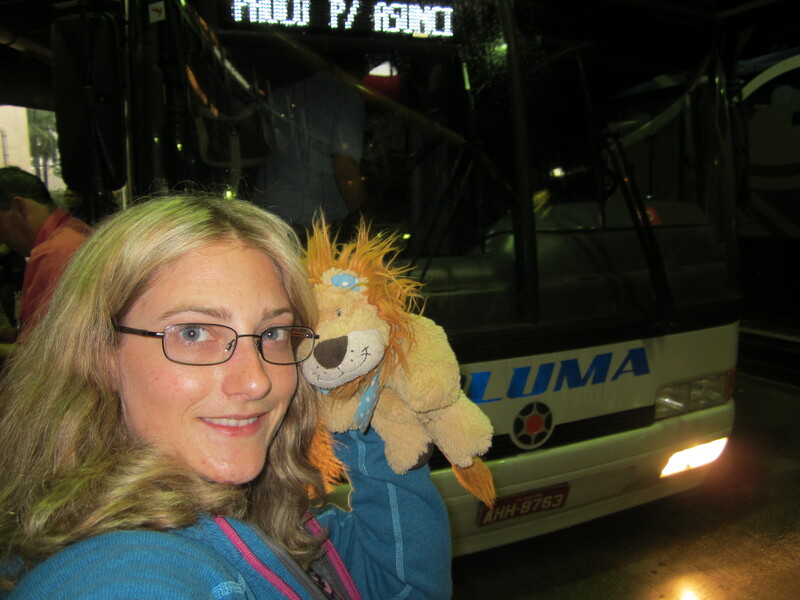 This entry was posted in Lewis' Blog and tagged birthday, Brazil, bus, children's travel blog, coach, educational travel blog for children, for kids, Lewis the Lion, Paulista, Sao Paolo, travel blog, travel blog to inspire kids. Bookmark the permalink. 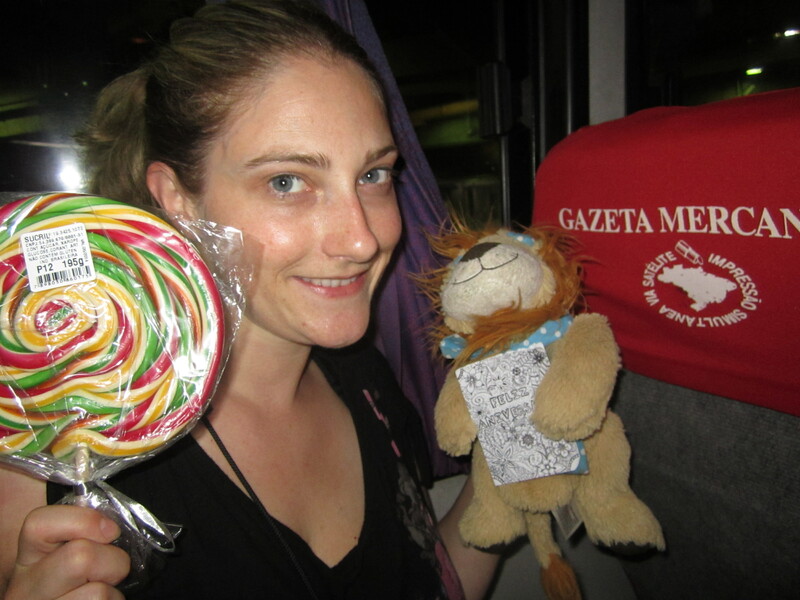 2 Responses to Lewis the Lion and Helen celebrate their birthday on a bus! 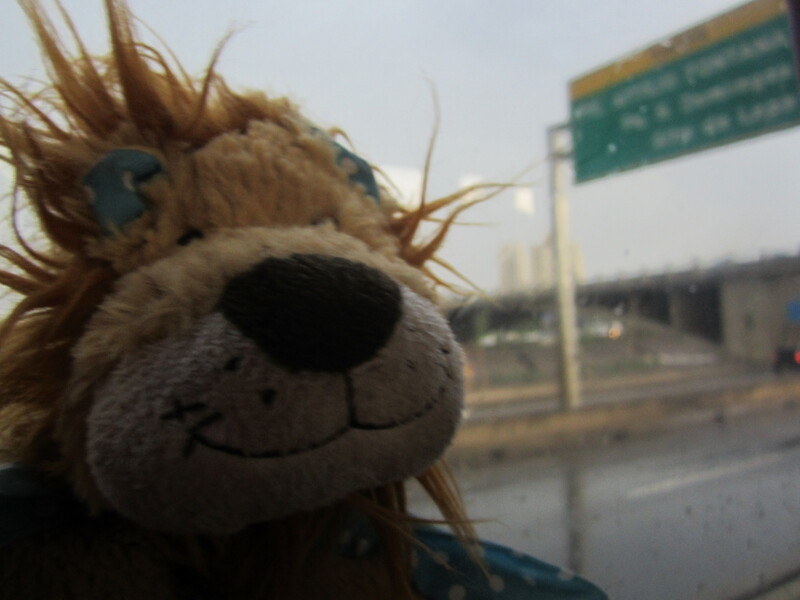 Lewis the Lion says “Grazie,” and says “Ciao!” to all his friends in Italy. V.V.B.